Haloragaceae (the watermilfoil family) is a dicotyledon flowering plant family in the order Saxifragales, based on the phylogenetic APG III system. In the Cronquist system, it was included in the order Haloragales. The distribution of the family is nearly worldwide. The center of species diversity is in Australia where all genera are found excepting Proserpinaca and Laurembergia. The terrestrial taxa are primarily limited to the southern hemisphere. Glischrocaryon, Haloragodendron, Meionectes and Trihaloragis are Australian endemics. Most members of the Haloragaceae are herbaceous, and most of those in turn are perennials, though some species are annuals. In contrast however, members of the genus Haloragodendron are woody. Some genera are primarily terrestrial (Glischrocaryon, Gonocarpus, Haloragis, Haloragodendron and Trihaloragis) while others are primarily semiaquatic (Laurembergia) or aquatic (Meionectes, Myriophyllum and Proserpinaca) of freshwater systems. 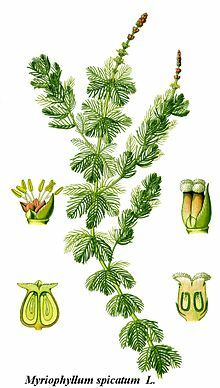 Most species of Myriophyllum are monoecious while most other taxa have hermaphrodite flowers. The flowers are usually small and inconspicuous, but some genera can have more "showy" conspicuous flowers (Haloragodendron, Glischrocaryon). Flowers are usually radial (2-3)-4 parted, petals are usually keeled or hooded when present. In Myriophyllum female flowers usually lack a perianth. They have (2-)4-8 stamens and an inferior ovary of (2-)4 carpels. In Myriophyllum the fruit is a schizocarp of 1-seeded 'nutlets' other genera can have nuts or drupes that can be winged or inflated. The taxa of the earlier family Cercodiaceae and Myriophyllaceae are now included in the family Haloragaceae. Earlier, the genus Gunnera was included in this family, but it is not related and now placed in Gunneraceae, a family of the order Gunnerales. Wikimedia Commons has media related to Haloragaceae. ^ Orchard, A.E. (1975). "Taxonomic revisions in the family Haloragaceae. 1. The genera Haloragis, Haloragodendron, Glischrocaryon, Meziella and Gonocarpus". Bulletin of the Auckland Institute and Museum. 10: 1–299. ^ Moody, M.L. ; Les, D.H. (2007). "Phylogenetic systematics and character evolution in the angiosperm family Haloragaceae". American Journal of Botany. 94 (12): 2005–2025. doi:10.3732/ajb.94.12.2005. PMID 21636395. This page was last edited on 18 January 2019, at 10:29 (UTC).